General admission seating; get in early for a good seat in front! Glenn Kubota, Virginia Wing, Mia Katigbak, and Bex Kwan in Sagittarius Ponderosa. Photo by William P. Steele. BOTTOM LINE: A step in the right direction to present more authentic trans Asian American stories. In a recent public forum on Asian American representation called "Beyond Orientalism," National Asian American Theatre Company's artistic director and acclaimed actress Mia Katigbak spoke eloquently and gleefully of her company's role in challenging Asian stereotypes in the arts. For example, Katigbak described how some may ask, "Can Asian Americans be Jewish?” (regarding NAATCO’s ’98 and ’07 productions of Falsettoland), and Katigbak responded with a resounding, “Yeah!" 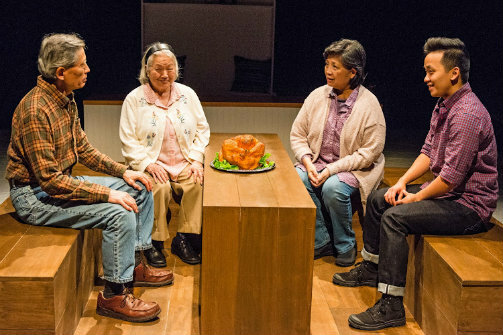 Currently, NAATCO's production of Sagittarius Ponderosa continues to demonstrate that “Asian American” is not a monolithic experience or identity, by answering, "Can Asian Americans be trans?" with an equally confident "YEAH!" Sagittarius Ponderosa centers around Archer (Bex Kwan) and his family. Pops (Glenn Kubota) struggles with diabetes, Archer cannot get his family to recognize him as male (they still refer to Archer as "Angie," "her," and "my daughter"), and Grandma (Virginia Wing) is banking on her "granddaughter" getting married. Ironically, for a character who takes so much pride in his Sagittarius astrological sign—a sign, named for a constellation of a hunter, that is known to shape the personalities of driven, goal-oriented dreamers—Archer is paralyzed and utterly lost, without certainty that his family loves him for his true identity. Throughout the play, the building blocks of loving relationships are slashed, burned, and recycled as the family finds a new balance in the shade of the nearby Ponderosa forest. As the final play in NAATCO's 25th-Anniversary Season, the goal of Sagittarius Ponderosa is to present "a play not written by, for, or about Asian Americans, but presented with an all Asian American cast." While I applaud the intention of this programming, I am not certain the production completely succeeds in breaking down stereotypes of what Asian American companies can achieve. Several elements of Ken Rus Schmoll's direction and Kimie Nishikawa’s scenic design try to fuse traditional Japanese theatrical forms (specifically Noh and Bunraku) with the play's Western tone (naturalism with hints of magical realism and supernatural influences), but the result is tonally disjointed. Rather than celebrating what these artists, who happen to be Asian American, can inherently bring to a play written about a racially non-specific American family, this direction feels like an unnecessary reminder of the company's "Asian-ness," and a tack-on that distracts from the story rather than serving it. Aside from this conceptual misalignment, there are other aspects of Sagittarius Ponderosa that make the 60-minute one-act worthwhile. Katigback, who also acts in the production, delivers sensitivity and strength as Archer's mother, giving the best performance of the whole ensemble by far. Her specificity in depicting her complex grieving process adds depth and color to what could be telegraphic and monochromatic lines. And the lighting and sound design (by Oliver Wason and Miles Polaski respectively) blend beautifully together to create an ethereal, foreboding winter landscape. Though the play primarily examines the family members' private lives, the strongest scene is the one public gathering in the whole story. Without giving away the specific plot point that brings the family into this public assemblage, I will say that the script and staging particularly succeed here in providing a snapshot into each character's internal turmoil, while they must put on their brave, public "masks." Schmoll also succeeds in crafting lovely stage pictures, particularly those that highlight the ways Archer’s father subtly, kindly influences every aspect of the family members’ consciences. And of course at the end of the day, representation of both Asian Americans and trans people matters, and the intersectional representation of trans Asian Americans is all too rare. Thanks to work like Sagittarius Ponderosa, NAATCO is able to help bridge this gap while employing trans artists, making themselves not only allies to the trans community, but also leaders in making more authentic representations of trans people, Asian Americans, and LGBTQIA people of color in general. Sagittarius Ponderosa is by MJ Kaufman. Directed by Ken Rus Schmoll. Set Design is by Kimie Nishikawa. Costume Design is by Brynn Almli. Lighting Design is by Oliver Wason. Original Music and Sound Design is by Miles Polaski. Projection Design is by Thomas Kavanagh. Puppetry Design is by Tom Lee. Properties Master is Chloe Kirkwood. Stage Manager is Maddie Gartenstein. The cast is Daniel K. Isaac, Mia Katigbak, Glenn Kubota, Bex Kwan, and Virginia Wing.